The Crown Prince of Saudi Arabia, Mohammed bin Salman, has been in London today, getting right royal treatment befitting of a state visit, with lunch with the Queen, tea at 10 Downing Street and dinner with Prince Charles. There was some bemusement yesterday among Londoners as electronic billboard vans drove round the city welcoming MBS’s arrival, and today many newspapers had three half-page spreads reinforcing that message. For anyone familiar with the Gulf monarchies that is not in the least surprising, however; rulers and their crown princes are celebrated with giant pictures everywhere in their home territories, including whole sides of multi-storey buildings. Such apparent vaingloriousness is infra dig in Britain, but we should remember that we started eroding the power of absolute monarchs 800 years ago, whereas Saudi Arabia is a kingdom only 80-odd years old. I was kept busy myself today, doing both television and radio interviews about the prince’s visit, as well as attending a session on youth’s place in Saudi Arabia’s 2030 Vision, at the Dorchester Hotel (where else?). Several people elsewhere asked me outright: well, are you for or against this visit? As one might expect from someone with a background in Reuters and the BBC, and with one foot in academe, I answered in more nuanced terms. As Saudi Arabia is a signatory to the 1948 Universal Declaration of Human Rights and actually sits on the UN Human Rights Council it must expect its domestic human rights record to come under scrutiny. The detention of dissidents has increased since MBS’s sudden ascendancy to the role of neo-dauphin and the rate of executions has actually doubled these last few months. Similarly, the immense human cost of the war in Yemen — exacerbated by the blockade of the port of Hodeidah, which has caused widespread malnutrition — is a legitimate cause for concern, even anger, made more acute by the fact that British arms sales (and some advice) has been helping the Saudi war effort there. However, on the other side of the coin, MBS (with his father’s approval, presumably) has ushered in some reforms that are noteworthy, such as the lifting of the ban on women driving later this year and at least a partial crackdown on corruption, as well as the introduction of VAT as a new source of tax revenue. So he should not be condemned out of hand, but neither should he be the object of unqualified praise. As I quipped on BBC Radio London this afternoon, under MBS’s guidance Saudi Arabia has entered the 20th century, but it hasn’t yet arrived in the 21st. The ancient Romans referred to Yemen as Arabia Felix, but there is little that is happy about the country now. Often divided in modern history, it is now in danger of total disintegration. With only very limited oil resources, it is by far the poorest country in the Middle East, and unlike the other states located in the Arabian peninsula, it has never been allowed to join the Gulf Cooperation Council (GCC) — though the cohesion and usefulness of the GCC itself have been undermined with the recent stand-off with Qatar. Far more acute than the lack of oil, however, is Yemen’s depleted source of water; Sana’a risks becoming the world’s first capital city to run out of water completely. In rural areas that used to be fertile, subsistence agriculture is a dwindling lifestyle, as predominantly young men migrate to the cities in search of work. Such migration is of course a common feature of many developing countries, but it has been more acute in Yemen than in many other states. Moreover, the government of the late President Ali Abdullah Saleh compounded the situation by its corrupt handling of the economy, which enriched a small elite while impoverishing the masses. 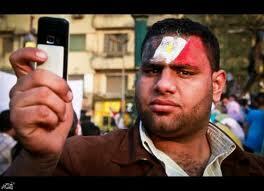 Hence the size and vigour of the anti-Saleh demonstrations that erupted during the 2011 so-called Arab Spring. However, even at the height of the uprising, the situation in Yemen was never black and white. There was always a complex nexus of rivalries, based on tribal loyalties, regional variations and a certain degree of religious difference. All too often the current conflict in Yemen is over-simplified as a battle between the Sunni-backed internationally-recognised but largely exiled government of Abdrabbuh Mansour Hadi and the Shi’i-backed Huthi rebels, but as Helen Lackner’s excellent book, Yemen in Crisis (Saqi, £25), explains with admirable clarity, Yemen’s modern history is far more complex than that. And as she points out, the military intervention of a Saudi-led coalition in 2015 turned a political and humanitarian crisis into a catastrophe. The Saudi blockade of the port of Hodeidah, for example, led to widespread malnutrition — not least among infants — that has been described by the United Nations as the most serious humanitarian crisis of our time. A major outbreak of cholera last year compounded the situation. As Helen Lackner rightly argues, the Saudi Crown Prince Mohammed bin Salman probably launched the Yemen War in the hope that a quick victory would cement his rise to power. But nearly three years on, the situation is a quagmire and it is the Yemeni people who are suffering. 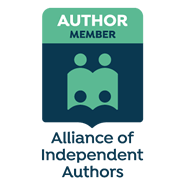 Helen Lackner is the ideal guide for readers wanting to understand some of Yemen’s complexities and how it has ended up in its current dire situation. She worked in the country for 15 years — largely in the field of rural development — and has been researching it for far longer. Her love of the place and its people shines through the text, which is academically sound but totally accessible to the general reader. I travelled widely in Yemen myself in the 1980s and 1990s, which Ms Lackner now sees as the good old days. Whether it will ever be possible for such a period of relative calm to return in the near future remains to be seen, but even if so, the cost of reconstruction is going to be gargantuan, as the destruction of Yemen’s infrastructure and unique cultural heritage continues apace. Eight anti-armaments campaigners, who were charged with blocking the entrance to last September’s giant arms fair in London, DSEI 2016, were this week found not guilty, on the grounds that they had acted in good faith to prevent an even greater crime. After listening to four days of often passionate testimony, the judge said the court had heard compelling evidence of the role of weapons on sale at DSEI in repression and human rights abuses. During the trial, the defendants had particularly highlighted the use of weapons in Saudi Arabia’s attacks in Yemen, the suppression of dissent in Bahrain and Turkey’s military activities in predominantly Kurdish areas of the country. They also argued that some illegal types of weapon had been openly displayed at the Fair. An estimated 30,000 visitors went to the Fair despite the disruption by protesters. DSEI is one of the largest such events in the world and a,though another one is planned for next year, anti-war campaigners are determined to be out in force on that occasion too. When he visited the BAE Systems factory in Preston yesterday UK Prime Minister David Cameron boasted of his success in helping promote “brilliant” arms sales top Saudi Arabia, whereas he should have hung his head in shame. Of course the Desert Kingdom and other Gulf states have the right to defend themselves and it is natural that Britain, as a major arms producer, should wish to corner an important part of a lucrative market. However, Saudi Arabia is not a normal case, for at least two reasons. The first is the air campaign it has been waging in Yemen, which has caused not only immense physical damage — including, reportedly, to all the country’s universities — but serious civilian loss of life. All this in by far the poorest country on the Arabian peninsula, in which hundreds of thousands of people, especially children are suffering from acute malnutrition. The second reason for Britain to balk at its cosy relationship with Saudi Arabia, rather than bask in it, is the Kingdom’s egregious human rights record. Since King Salman came to power, far from reducing the number of executions Saudi Arabia has accelerated their number. Medieval punishments are carried out under the false flag of religion, while women are still denied a full place in society and those who dare criticise the system, such as the liberal blogger Raif Badawi, face imprisonment, flogging or worse. The European Parliament rightly called for an arms embargo against Saudi Arabia this week, because of the Yemen conflict, though Mr Cameron’s Conservative MEPs failed to back that resolution. Labour politicians Jeremy Corbyn and Hilary Benn, to their credit, have spoken out in Britain and Tim Farron and other Liberal Democrat figures have also made their revulsion known. But the spotlight needs to be turned on David Cameron, who is presiding over a government that has put human rights concerns on a back burner and which celebrates making billions from arms that are not for legitimate defence but for offensive action beyond Saudi’s borders and sometimes for domestic oppression as well. The British Foreign Secretary Philip Hammond is in Tehran today, reopening the Embassy that has been closed for four years following its invasion by demonstrators. Given the recent progress in international negotiations regarding Iran’s nuclear ambitions this was an inevitable and welcome step. 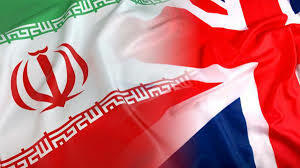 Though Brtain’s engagement in Iran has not always been positive there are strong reasons for the UK — and indeed the European Union — to have closer working relations with this important Middle Eastern power. Commercial opportunities are obvious, but trade should not be the only focus for attention. 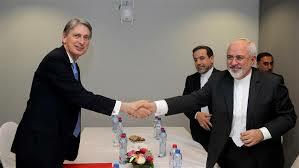 If there is going to be a regional settlement of Syria’s ongoing civil war then Iran is going to have to be involved. Similarly, wider regional insecurity as well as the fight against ISIS, require closer contacts with Tehran. In particular, it would be helpful to reduce the rivalry between Iran and Saudi Arabia, which has been a central cause of the recent events in Yemen. Britain can also usefully use its influence to try to calm Israeli rhetoric against Iran and vice versa; yesterday, in an interview, the former Israeli Prime Minister Ehud Barak confirmed that Israel had considered attacking Iran four times over the past decade. Iranian propaganda against what it refers to as the “Zionist entity” is often poisonous, but Israel would find itself in a less ignominious position if it withdrew from occupied Palestine. There is, however, one other major issue that could be an impediment in the way of much closer British-Iranian relations and that is human rights. The Islamic Republic has a poor record in a number of areas, including the treatment of its Ba’hai minority, Kurds, political dissidents, LGBT population and others. And although the UK Foreign Office recently downgraded its emphasis on a worldwide campaign against the death penalty it should not let this issue drop off the agenda in discussions with Iran. A year ago today the young Tunisian itinerant fruit-seller Mohamed Bouazizi set fire to himself outside the municipal offices in the southern town of Sidi Bou Zid. He had reached the end of his tether after months of harassment and humiliation at the hands of the police and the authorities; little could he know that his act would trigger the undiginfied departure into exile of longstanding President Ben Ali and the beginning of the so-called Arab Spring (which I prefer to refer to as the New Arab Awakening). A year on, the leaders of Egypt, Libya and Yemen have gone and Syria’s President Assad is under threat. But the democratisaton process has been neither as swift nor as smooth as that which happened in central and eastern Europe 22 years ago. People are still losing their lives, not only in the worsening civil war in Syria, but also in ongoing incidents in Egypt, notably. It is still far from clear whether Egypt’s Revolution will lead to what many of the liberal-minded demonstrators in Tahrir Square in Cairo hoped for. Moreover, minor disturbances or marches continue in other parts of the Arab world, including Jordan and Saudi Arabia. It is not only dictatorial presidents who are potentially at risk now but also some hereditary monarchs. 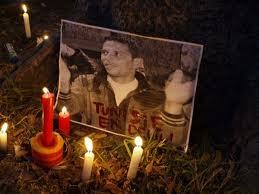 But even though Mohamed Bouazizi’s self-sacrifice was an act of despair, as Tunisia today leads commemorations of the first anniversary of his self-immolation, there is hope that at least in some parts of the Middle East and North Africa we are seeing the dawn of greater respect for the aspirations of ordinary people and for human rights. Like many bloggers and tweeters I stayed up late last night, transfixed by the scenes in Tripoli, where the National Liberation Army (as I prefer to call it) penetrated neighbourhoods of the city, including the iconic Green Square, which was immediately renamed Martyrs’ Square. At least two of Mouammar Gaddafi’s sons have been captured and it can only be a matter of time before Gaddafi himself is cornered. Will he do a Hitler and shoot himself, or arrange things so that he gets killed? Or will the cause of justice be served by him and some of his closest associates being taken to the International Criminal Court (ICC)? It’s staggering to think how fast events have moved since the impoverished Tunisian fruit-vendor Mohamed Bouazizi immolated himself last December. The Tunisian President Ben Ali fled to Saudi Arabia, Egypt’s President Mubarak was forced to resign and is now on trial, Yemen’s President Saleh was seriously injured in clashes during the uprising to oust him and remains in hospital in Saudi Arabia — which has a reputation now as the retirement home for dictators, beginning with Uganda’s Idi Amin. 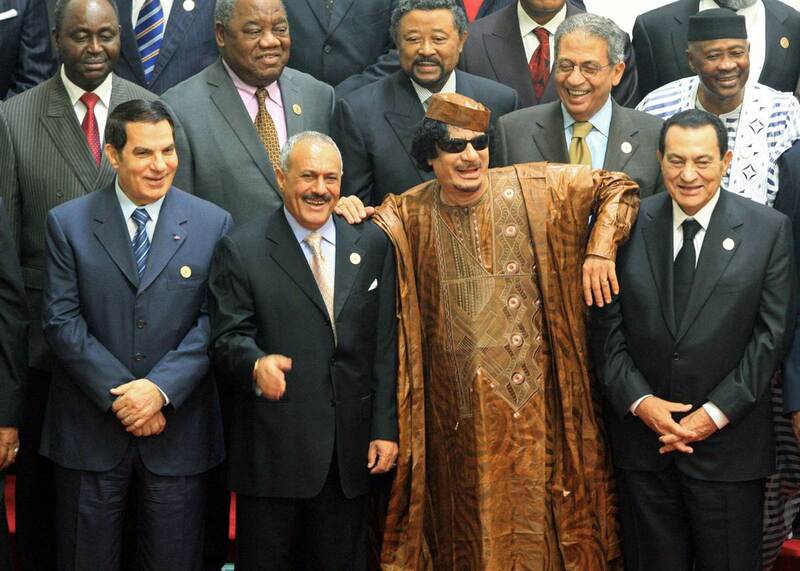 And now Gaddafi’s day of judgement is nigh. To remind ourselves of the speed and significance of these events, just take a look at the photo here of the four dictators looking so pleased with themselves at an African Union Summit last year. And next? Syria, inshallah. ‘The European Union is one of the most calming and peaceful mechanisms in the world today,’ Baroness (Emma) Nicholson, MEP, told Kensington and Chelsea Liberal Democrats at one of their ‘Food for Thought’ supper events this evening, citing the EU’s work in election monitoring and promoting tertiary education in particular. The Union has extended its reach dramatically during the ten years she has been a member of the European Parliament, both through enlargement to take in 12 new member states and also because of fate, she said. Events — including terrorism — have transpired to encourage EU member states to become more involved in countries from Afghanistan to Zimbabwe — though not in a colonial way. Emma Nicholson’s own focus has often been on Romania (notably relating to children’s rights) and, more controversially, Kashmir, but she has just returned from south Lebanon, where she was part of the EU’s monitoring team covering the Lebanese general election, especially in Hezbollah-dominated areas. As Vice-Chairman of the Parliament’s Foreign Affairs Committee, Emma has dealt with a whole range of crucial international issues during her decade shuttling between Brussels, Strasbourg and the South East of England region that she represents, not to mention the extended periods of time she has spent in various parts of the Middle East, notably Iraq and Iran. She was seconded for several months to a European Commission election monitoring operation in Yemen, raising some eyebrows among her constituents, but building expertise which will be invaluable to the LibDems’ foreign affairs team when her Euro-parliamentary career ends in five weeks time and she resumes a more active role in the House of Lords. But in the meantime, she is due to launch an Iraqi-British business association next Monday in London, to encourage British investment in Iraq and bilateral commercial cooperation.